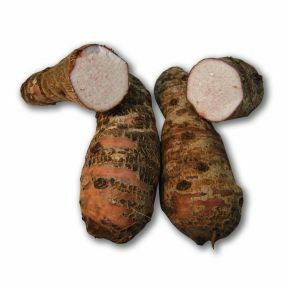 Malanga Lila is similar in texture and appearance to the Yuca and Taro, but has a woodsy taste with a hint of black walnut. Especially common in Cuba and Puerto Rico, it is typically deep-fried as a fritter or chip. It can also be prepared mashed, baked, boiled, or sautéed. Very similar to Malanga Blanca with the exception of a pink flesh than a white flesh. Handling: Ideal temperature is between 50º F to 75º F. Malanga Lila should be kept dry and well ventilated. Typical shelf life is up to three weeks. Avoid frequent temperature changes.